This is my Bob blog for extra marks . blue to red 2:10, 4:20, 6:30, 8:40, 10:50 . To make equivalent ratios , what you got to keep in mind is , Whatever you do to one side you have to do to the other , so 2:10 is equivalent to 1:5 ... so you divide the 2 by 2 and since you did that to one side you have to do it to the other so 10 divided by 2 is 5 so 1:5. 1. What is the ratio of yellow to red? 3. Show 2:4 as a fraction , decimal and percent. 1. 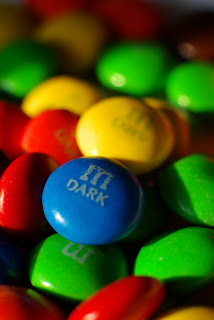 Do you like M&Ms? Well part is about my test , to be honest im kind of proud of my mark but i know there is still room for improvement . 18:27 , i put 6:9 and it said to express in lowest terms but i didn't put it in lowest terms , but the answer would of been 2:3.
and there was another one about the cards in the deck. red cards to whole deck and i answered 2:4 , i forgot to simplify and 1:2 was there. But in my defense it did not say express lowest terms but I guess it was my fault cause we always have to simplify. Jerick i don't think you need to answer your own questions or I can't study. But your scribe was done very well. yeaa.. I kinda agree with eric because yea.. its gonna be hard to study if you put the answer already. and some people might copy your answer instead of doing it on their own.. Im just saying.